Now available for order from our partners at Indie Press Revolution: Beckett’s Jyhad Diary Deluxe Edition! 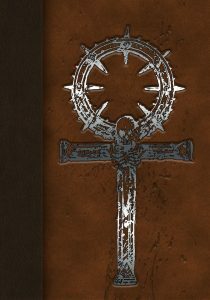 Beckett’s Jyhad Diary serves as the definitive book of setting and plot for Vampire: The Masquerade, containing 30 chapters spanning different geographical regions, encountering vampires of every clan, profiling obscure and profound segments of the mythology, and providing countless story hooks on every page. Also available for V20: Beckett’s Jyhad Diary V20 Storyteller’s Screen and Vampire: The Masquerade 20th Anniversary Edition Dice! The screen is a sturdy three-panel foldout with pertinent charts and quick-reference information for V20 games. 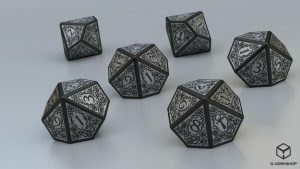 The dice are, made by Q Worshop, are elegant grey-and-black featuring the numbers 1 through 9 in the familiar Vampire title font, and the V20 ankh taking the place of the 10, surrounded by thorned rose vines. Also available: Changeling: The Dreaming 20th Anniversary Edition Deluxe Edition! This 20th Anniversary Edition of Changeling: the Dreaming returns to that deceptively bright yet terrifying world and both compiles and completes the concepts of the previous two editions. Led by veteran White Wolf and Onyx Path developer “Blackhat” Matt McFarland, our writing team consists of longtime Changeling creators like Ian Lemke, Jackie Cassada, Nicky Rea, and Peter Woodworth, as well as familiar names such as Holden Shearer, John Snead, Maggie Carrol, Matthew Dawkins, and Krister Michl. 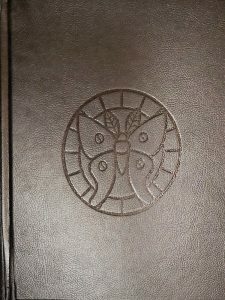 One and all are dedicated to making Changeling: the Dreaming Twentieth Anniversary Edition the most playable edition yet – while not losing the wonder, awe, and majesty that Changeling is known for. A revised and up to date look at the World of Darkness through the eyes of the Kithain – what has happened to the Dreaming in the last 20 years, and what is the state of Glamour and dreams? 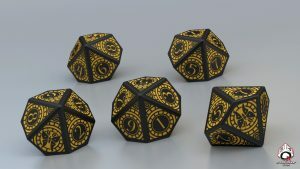 Also available for Changeling: Changeling: The Dreaming 20th Anniversary Edition Storyteller’s Screen and Changeling: The Dreaming 20th Anniversary Edition Dice! Like the screen above, this is a sturdy three-panel foldout with useful reference information for Changeling Storytellers. The Q Workshop dice display the numbers 1 through 9 (with the signature Changeling luna moth on the 0 face) placed in a stained glass motif. For more about our partnership with IPR, please see Rich’s recent Monday Meeting Notes. 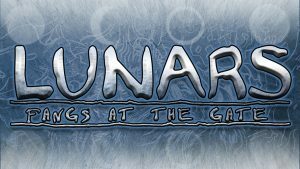 Our next Kickstarter is going to be Lunars: Fangs at the Gate for Exalted 3rd Edition, coming up on February 12 at 2pm Eastern!